Cancer cases projected to skyrocket to one in two men in the future: How will you prevent it? (NaturalNews) This is from a finding for future cancer rates in the UK. Currently, it is just under that risk rate, just under one for every two or 44 percent. It's no surprise that the numbers are almost the same in the U.S. for both men and women. So what to do about it? Well, the first thing to realize is that these predictions are based on current and recent trends, and they are, after all statistics. Perhaps 50 percent of the population, say 150 million out of 300 million, makes it less scary personally. But it's still a lot. As we age, more are diagnosed with cancer, though it seems more children are getting hit with cancer than before. The projected, 50 percent of the population includes all ages. The hereditary factor is bogus, unless someone has simply adopted many of his or her family's bad carcinogenic habits. More and more health experts are realizing that cancer is an environmental disease. This means you can do something about it. Minimize sugar and HFCS (high fructose corn syrup); avoid MSG and aspartame; avoid factory farm red meat and dairy; avoid junk food and processed foods with additives and/or GMOs; don't use hydrolyzed processed oils, but consume healthy fats; eat organic as much as possible. Then there are the unsafe cosmetics and household toxic, carcinogenic cleaners and detergents to stop using. You can add exercise and handling stress well too. Quite a list, eh? Most Natural News (NN) readers are aware of these issues or can find them using the NN site's search box. 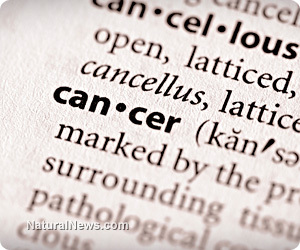 Here's one aspect of cancer prevention that's not so well understood. Everyone has some free floating cancer cells around. Pancreatic proteoylitic enzymes are capable of bursting those cancer cell walls. If we use up what our pancreas can produce solely to digest food because our foods are lacking sufficient digestive enzymes, we rob the pancreas of its metabolic and proteolytic enzymes. Pancreatic proteolytic enzymes are capable of destroying individual cancer cells, and other metabolic enzymes are important for non-cancerous cells' ability to metabolize oxygen. Very early in the 20th century, Scottish embryologist Dr. John Beard realized that pancreatic proteolytic enzymes were the body's main defense against cancer, and could even be used as a therapy for existing cancerous conditions. Those cancer cells are destroyed by the enzymes from juicing raw vegetables and fruits and the pancreatic metabolic enzymes that are freed up by the added digestive enzymes. Slow speed masticating juicing preserves the abundant enzymes of raw, organic produce. Without enzymes as metabolic catalysts, minerals and vitamins are almost meaningless anyway. Reducing cancer risk is yet another reason why juicing and supplementing enzymes should not be neglected.